Financial viability can make or break a neurology department in an academic medical center. In the first summit for neurology chairs, organized by the AAN, neurology chairs shared their frustrations and solutions for addressing the challenges of the job. The pressures of leading an academic neurology department today are not for the faint of heart, one neurology chair at a major academic center told a group of attendees at the first summit for neurology chairs convened by the AAN in March. In round-table and panel discussions, presenters and participants alike voiced these themes: The neurology chair must be a financial steward and manager, a business leader, a fundraiser, negotiator, and all-round go-between between clinical staff and hospital administrators. And mastery of these roles could make or break a neurology department in the larger academic medical center. Dr. England urged them to negotiate and to seek formal contracts. “As I tell my young faculty members, the most certain way to not get a contract is to not ask for one,” he said. Dr. England negotiates for education, research, and service dollars from the school of medicine and other institutions, and explained how important that is in order to cross-subsidize members of his department, especially his general neurologists who are not as well reimbursed as most subspecialists for their services. Dr. England also stressed the need to quantify “downstream revenue,” one of the most frequently echoed sentiments at the summit. These data, which include items such as neuroradiology and laboratory orders, surgery, and other referrals, are needed to make the case to hospital administrators for the transfer of resources to neurology. Indeed, it was the number one issue — chosen most often from the list of 13 choices of topics by the 61 chair respondents to the pre-summit survey. These data, which strengthen the argument for financial support, are not always available from administrators. At breakout sessions, some chairs shared their strategies and successes, while others voiced frustration at not having access to the data from administration at their institutions. To this point, he predicts that in the next few years, patients are going to be driven out of large institutions, health care will be decentralized, and facility fees will go away. He advised attendees to get a revenue cycle manager, as his department did, and to focus on high-yield codes such as those for chronic care management and transitional care management. One strategy the revenue cycle manager introduced was low-tech: laminated blue cards that instruct faculty on how to code properly for these higher revenue CPT codes. The department was able to recoup over $300,000 dollars a year by bringing in an expert who was able to focus on correct coding for neurologic services. He pointed out that the AAN is continuing to work on identifying coding and billing best practices for academic and community groups alike and disseminating them broadly. “There are specific challenges unique to academic departments including shared note writing with house staff, large inpatient services, and management of funds with health systems and research enterprises,” he said, adding that sharing best practices among chairs will be a key step going forward. Frances E. Jensen, MD, FACP, FAAN, chair of neurology at the University of Pennsylvania, said that using advanced practice providers (APPs) productively across service lines is important. Asking the audience for a show of hands as to how many employed APPs yielded a near unanimous response. But only a few people raised their hands when she asked how many used APPs maximally. “There is a gap there,” she observed, explaining that each professional needs to operate at the top of their license for maximal efficiency. A common concern — tied for second place in the survey — were trepidations about the neurology pipeline, recruitment, and future of research funding. “I am particularly concerned about the future of neuroscience research,” said Natalia Rost, MD, MPH, FAAN, FAHA, chair of the AAN Science Committee. “In the current academic environment, there are scarce resources for the development and support of robust research programs at the department level. Dr. Rost said she hoped that the summit would encourage more dialogue that would ultimately lead to developing tangible solutions in support of the future of academic neurology. These include developing strategies to help departments assist faculty to be successful in research, finding pilot funding, improving chances for success through mentorship, and ways to negotiate with our institutions to maximize recovery of indirect costs, Dr. Rost said. “Recruiting a diverse faculty according to their activities and subspecialties, and also by race/ethnicity and gender, and retaining them are critical,” said Dr. Smith. The chairs also discussed how to recruit and integrate hospitalists into the department, how to recruit pure clinicians into the department to help meet the clinical demands, and how to use outreach to increase diversity in faculty recruitment and in the training pipeline. Indeed, participants shared many creative ideas about how to approach their numerous challenges. Two recurring themes, Dr. Smith observed, were the need for better data and the opportunity to build a community between chairs to share experiences and solutions, both objectives with which he believes the AAN can help. “My hope is that the summit will be the beginning of an enduring initiative to support academic departments of neurology in collaboration with the American Neurological Association [ANA] and the Association of University Professors of Neurology [AUPN],” Dr. Smith concluded. What worries your neurology chair most? On the first Monday in March, fortuitously wedged between two Nor'easters, I flew to O'Hare to find out. There, at an airport hotel, the first Neurology Chair Summit was being convened to brainstorm ideas and share solutions for issues threatening neurology departments. Nearly 100 of the nation's 140 or so adult neurology chairs were in attendance. The concept, which had had been considered for some time by the AAN, gathered steam in June of 2017 at a joint Science and Education Committee meeting. Within two months, a work group had been formed, chaired by AAN President Ralph Sacco, MD, MS, FAHA, FAAN, chair and professor of neurology at the University of Miami Health System. The 12-member team comprised nine other chairs including the AUPN President Karen C. Johnston, MD, MSc, and ANA immediate past President Barbara G. Vickrey, MD, MPH, FAAN, as well as the AAN Science Committee Chair Natalia S. Rost, MD, MPH, FAAN, FAHA, and Education Committee Chair, A. Gordon Smith, MD, FAAN. The work group met frequently and together developed a list of potential topics of interest. They then polled department chairs to see which of 13 topics — comprising multiple challenges — were most dire, so they may be able to discover innovative solutions to the problems they face. 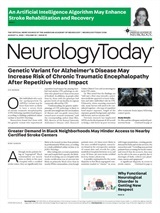 Neurology Today18(7):47-51, April 5, 2018.